← Why I give to Outward Bound. In 990 AD, the Archbishop of Canterbury, Sigeric, walked to Rome; invited by Pope John XV to be elevated to the position of Cardinal. We know this because his return trip was chronicled by a member of his party – 79 daily stages in all. 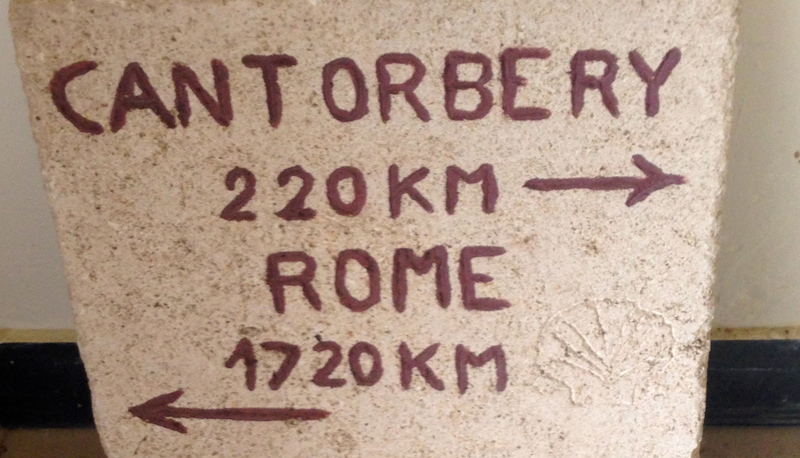 He wasn’t the first, the path had been used for years but for some unfathomable reason known only to the deeply devout, Sigeric’s journey inspired others to walk to Rome. It became a pilgrimage. 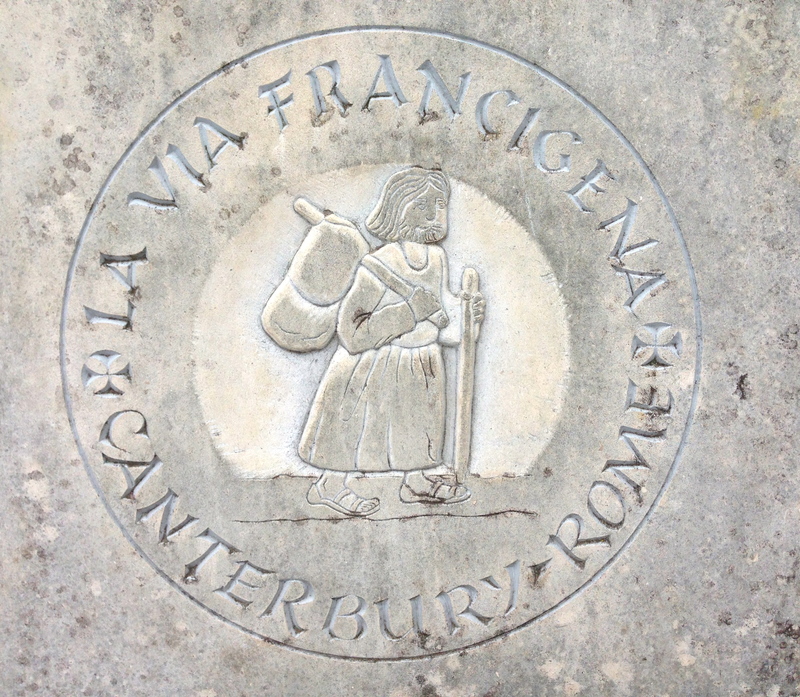 There is now a stone at Canterbury Cathedral that marks the official start point of the Via Francigena, this pilgrimage to Rome. Inestimable numbers of pilgrims have made the journey across Europe, they ebb and flow; yet through invasions, wars, the plague, predation from two and four-legged animals, scorching summer weather, freezing Alpine passes and other threats, pilgrims have endured. With only 2500 or so pilgrims annually, it’s a lonely walk; the Camino de Santiago sees one hundred times that each year. Lack of consistent and reliable signage, a paucity of services, poor accommodation and the shear magnitude of the challenge; it’s not for the faint of heart. Pilgrims walk the 1900 kilometers to seek enlightenment, the forgiveness of past sins, healing – the variety and breadth of motivations is as varied as the human condition. For a thousand years, we have sought some mystical prize that is delivered only with our arrival of the pilgrim in Rome. I am here only for a test drive. The challenge is too daunting to contemplate as a single three month walk; but maybe if I take it in chunks, I can overcome the overwhelming magnitude of the challenge. One-day-at-a-time is an axiom that applies to many facets of my life. 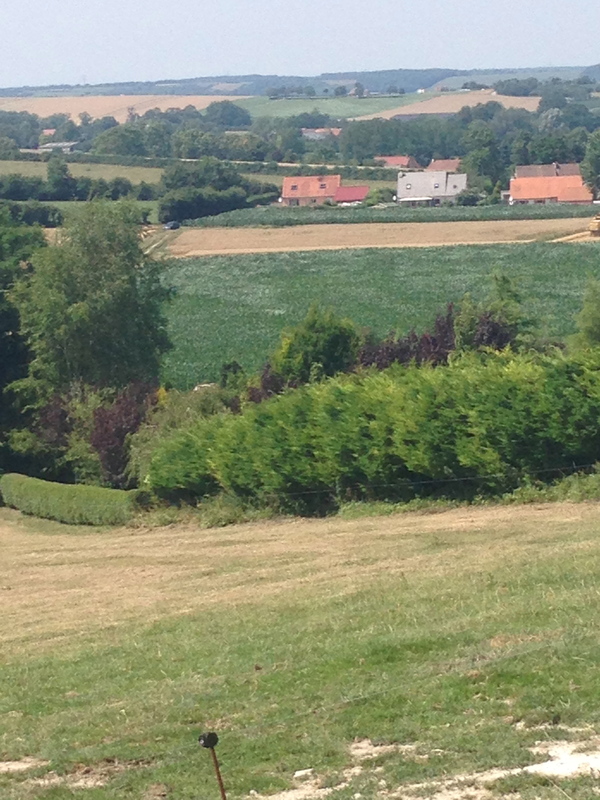 A two week walk from Canterbury to Reims is all I choose to achieve. 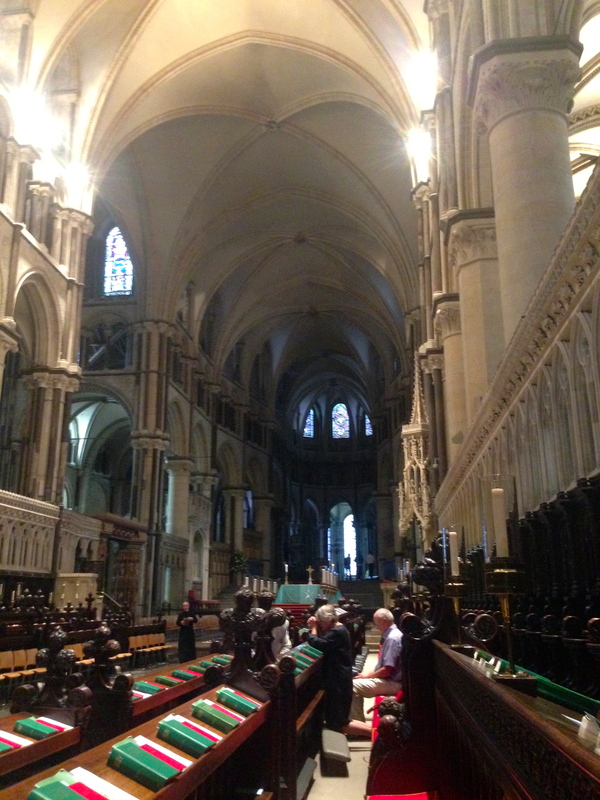 Canterbury is a fitting start. Immortalized by Chaucer for a smaller pilgrimage, the Cathedral has occupied center stage for people of faith since St. Augustine established the first church on the site in the 500’s. A Sunday prayer celebration seems a fitting way to start such an audacious journey. 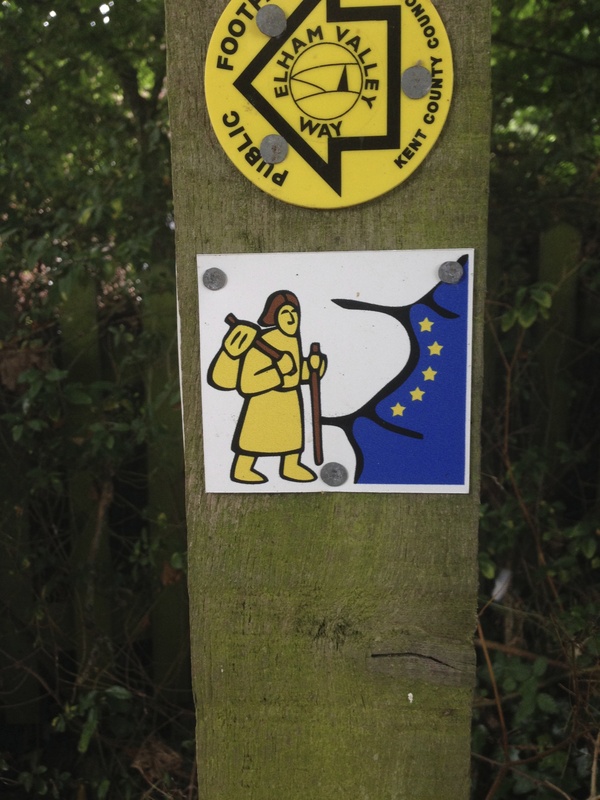 After the Canterbury service, I am off; my first meeting with the signs that will show me the way and my future guide (I haven’t named him yet) is a good omen, at least I can find the path out of town. 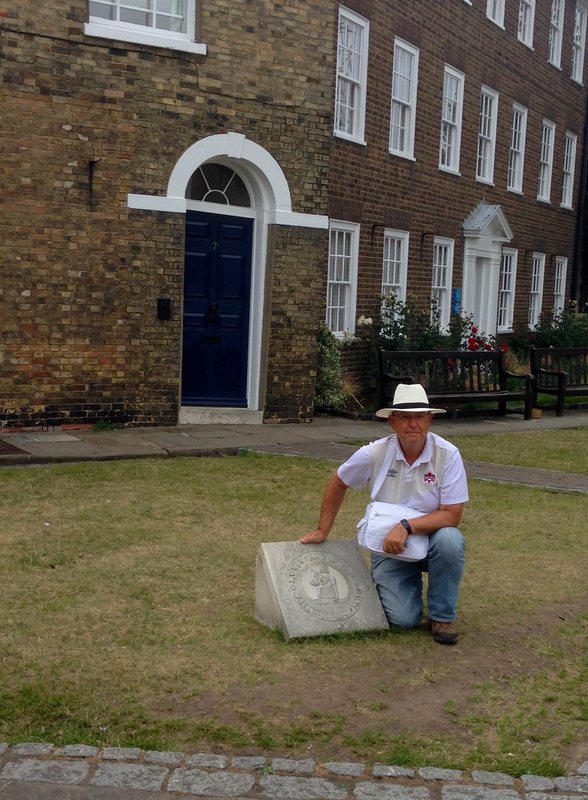 England requires two days of walking; in hot weather, I am challenged by jet lag, dehydration and the British ramblers desire to avoid a road at all costs even if it means adding miles of brambly, obscure paths that RAMBLE. Geez get over it already. After I’ve climbed a stile or two I’m not amused – in retrospect that may have been the jet lag talking. Yet, when my guidebook tells me to walk diagonally across a farmer’s field – unless the BULL is out to pasture – in which case I should walk around the field, I do lose some of my composure. I cross at Dover on a ferry filled with tourists and school groups. France is saner; my guidebook seems to favor small, farm roads through villages that are hundreds of meters long and one house deep. I’ve been warned; villages do not have services. There are no places for water, food, snacks, no pleasant villagers in berets with anecdotes and easily comprehensible directions (I would not have understood them anyway). 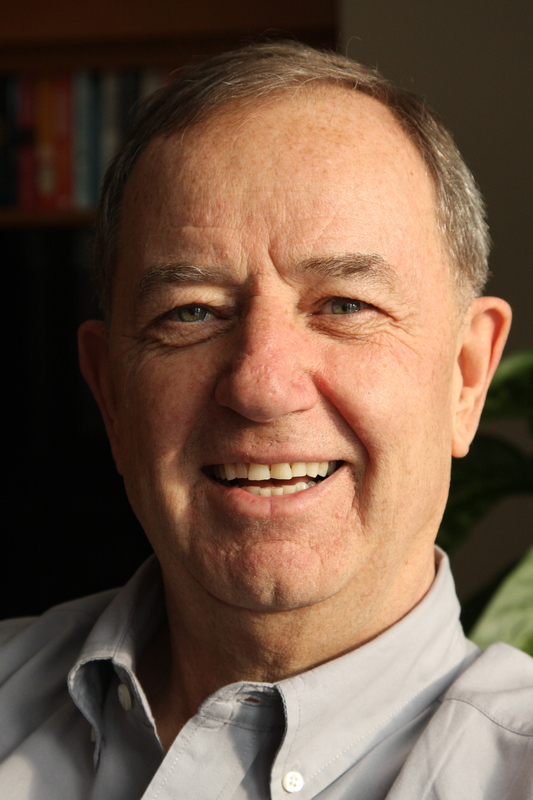 Finding accommodation is tough; the logistics of it all present a complicated daily puzzle to be solved – my day depends on making a series of choices. Fortunately, I like puzzles. I’ve found my walking legs, the pack is light, I have a guidebook, the sun is shining and the land is pastoral, reminiscent of 19th century paintings from the Louvre. Fields of golden wheat, endless rows of corn and sugar beets (I’m from Taber, the sugar beet capital of Canada and the home of the last remaining Canadian sugar beet factory – I know sugar beets, I’m strangely comforted by their familiarity). The routine is comforting in its own indescribable way. I rise, eat a bit, top up my caffeine level, and walk. The challenge of staying on path, the scenery, a few random thoughts interspersed with hours of mindful vacancy are a tonic for daily life. I forage for lunch, manage my water supply, self examine for sore spots and walk – anywhere between six and eight hours – I just walk. It feels good. At arrival I’ve achieved my simple goal. I dump my pack, wash myself and my clothes, sort out dinner and lie flat for a while. I eat simple French rural food at it’s best. Who knew French butter could taste so rich and creamy. I sleep well. 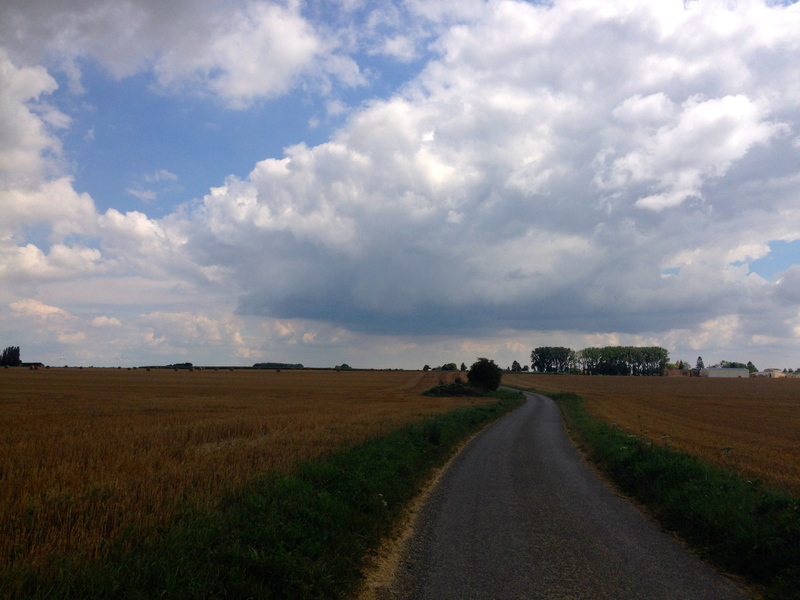 After six days, I arrive in Arras, the halfway point. Kristen joins me here for the walk to Reims. This adds a new dimension to my usual solo journeys, a companion! After a day of R&R in Arras, we set out. Auspiciously, the signage is clear, consistent and ample. We make good time; we walk, we talk, the kilometers seem to drift past us quickly. 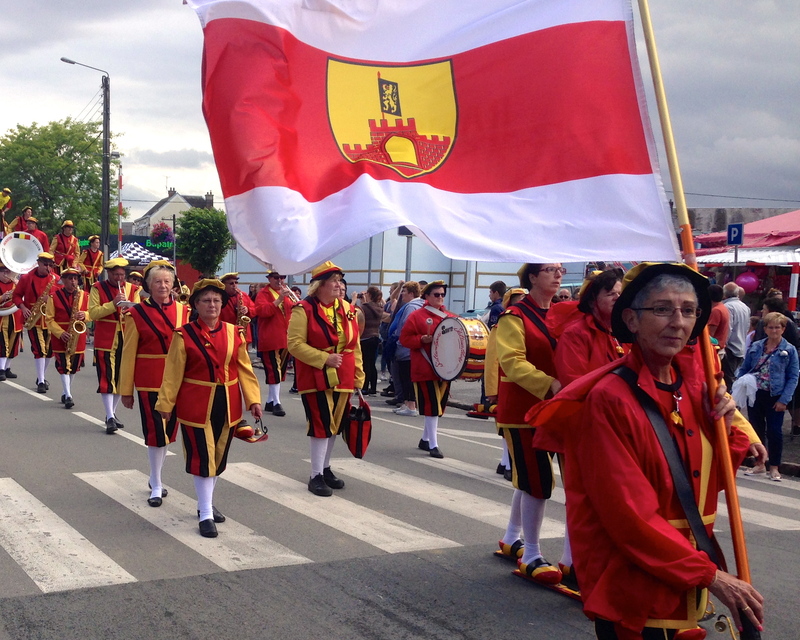 We’re rewarded with a serendipitous surprise – the circus has come to town in Bapaume, our destination for the day. We arrive in time for the parade! We drop our packs at the hotel, find some gooey French carny pastry and pull up a piece of curb to watch – doubly entertaining because its unexpected. We saw camels! Kristen is in her element; she loves puzzles. Our guidebook is outdated, sometimes incomprehensible and untrustworthy. The inconsistency and inadequacy of the guidepost signage is problematic – every wrong turn lengthens our day, tires us and leaves us frustrated – the guidebook becomes the F*#^ing book. She rises to the challenge, finding web-based resources I never knew existed – my six months of research is surpassed in a post dinner web-search. We have a google-map-app! 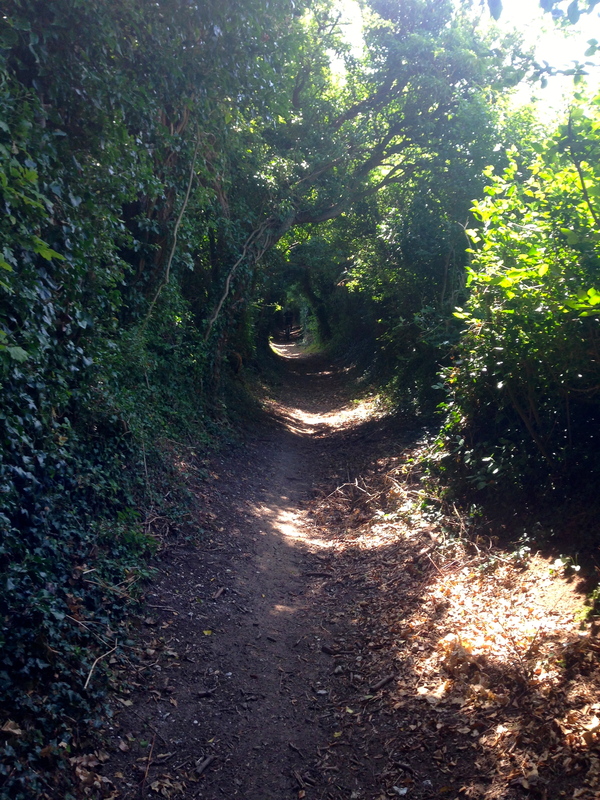 No more wasted walking, no more staring at a motley, overgrown path wondering if this really is the way forward – really? That path? Well, that’s what Google says. We (well, okay, she) get better; we manage to triangulate information from the F*#^ing book, Google and the app to devise the most efficient way forward, avoiding busy roads and unnecessary detours. 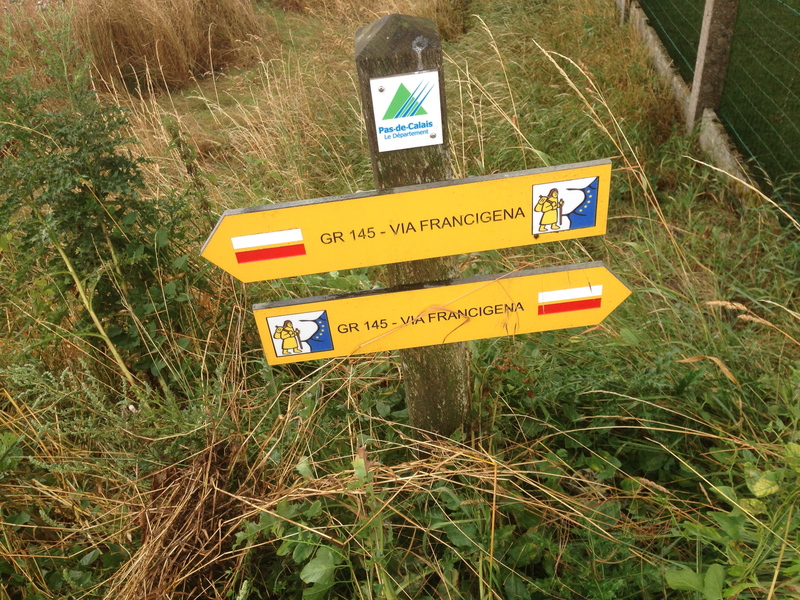 There is no one Via Francigena path; progress and freeways obscured much, but we do find a way forward. There is much to appreciate on our long walks; The rolling hills, the wheat fields golden, heavy and ready for harvest, a donkey that freezes us with his ungodly bray, the occasional Commonwealth gravesite, an inevitable result of a field hospital situated there 100 years ago, villages hollowed out by farm consolidation, efficiency and the inevitable migration to cities, only the elderly and the stubborn left behind, a rich tapestry of rural French life if you walk and observe. There are even a few paths that feel ancient, like we are walking on the stones laid by Roman slaves. 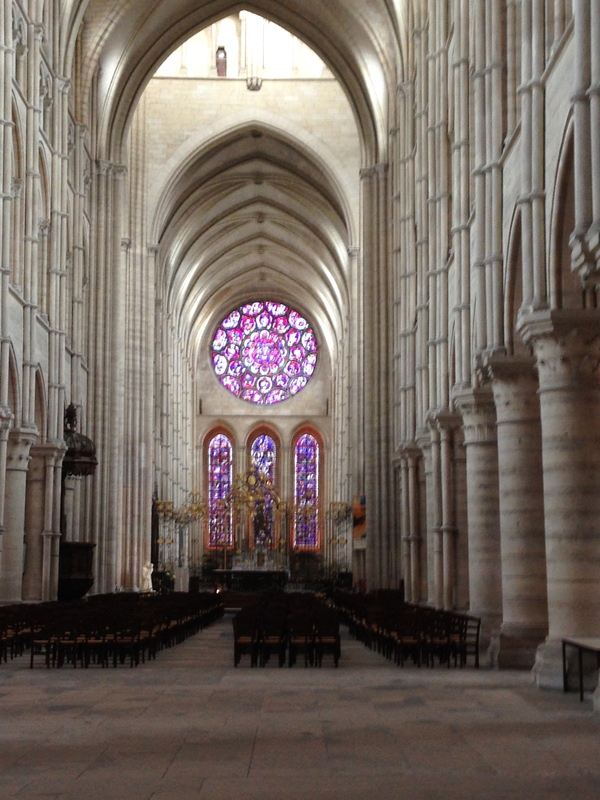 We reach Laon, a middling town with a brilliantly beautiful cathedral, perfect Gothic architecture of creamy, ivory colored granite that seems to soften our mood with its warm glow, beautiful stained glass windows – all helped by a bit of mood music – my favorites – Gregorian chants. Finally we find grapes, we reach the edge of Champagne – the region, the wine famous everywhere. Over the hill and off in the distance is the Cathedral of Reims, our destination. 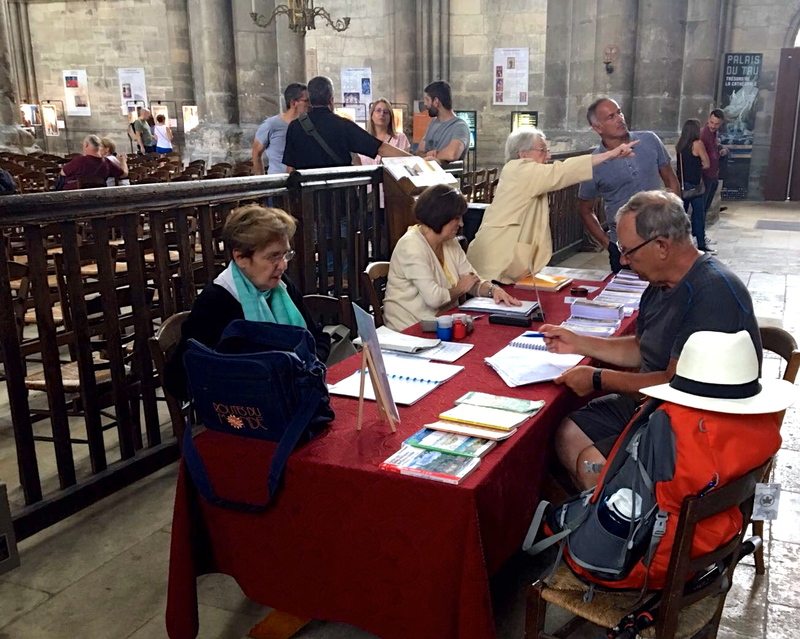 We arrive in time for a late lunch in the shadow of the cathedral and my checkin – I have pilgrim credential which is signed at spots along the way – validation of my walk and a valued keepsake all in one. 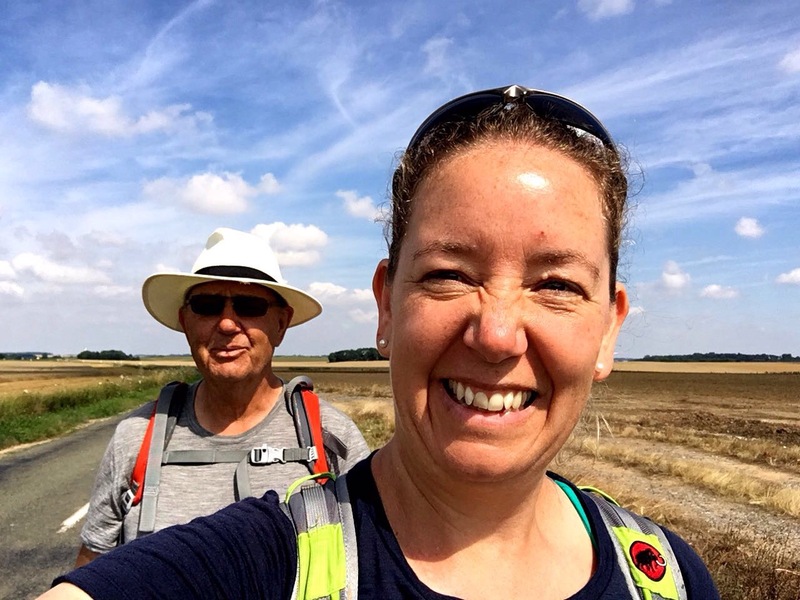 The stats say that we covered about 350 kilometers, one-sixth of the Via Francigena in about a half million steps; Kristen did more than half of that in her week. What the stats don’t count is the sheer joy of walking, the blessing of companionship, the connection with weather, land, the ground beneath our feet. 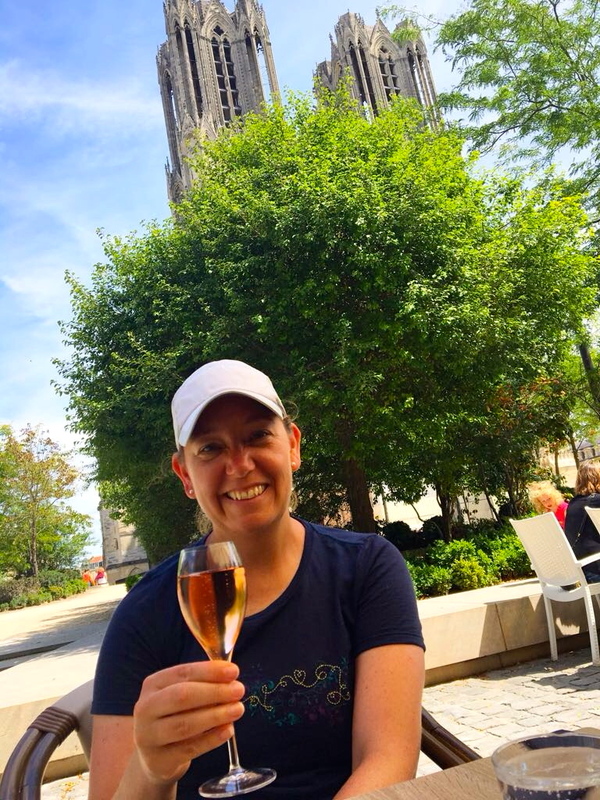 The simple joy of ravenously consuming a ham and cheese baguette, surviving a drenching summer rain with our sense of humour intact, the celebratory glass of champagne for my guide and companion, the pride of accomplishment in achieving something that can only be gained by one measure – footsteps. Maybe the other 1700 or so kilometers won’t be so bad after all…. Love this story Bob, as always love your ability to be authentic and down to earth, telling it like it is. It sounds like an amazing journey, thanks for sharing, and the laughs- I know once again at your expense, and as always for the inspiration. Bob, as always delightful, and as a result of your doing the walking I feel uplifted and my spirit refreshed and the bit about “the forgiveness of past sins” really works. Thanks for doing this in part for me. Bob, Another well told adventure. Sigeric should be impressed: you’re willing to take up the staff without being elevated to cardinal. Congrats to you and Kristen for your obvious orienteering skills. You two are setting a great example. Happy trails indeed! Especially when you get to share so much of the adventure with Kristen! Love reading the details complete with daily frustrations, pictures and the sense walking a journey reflective of past and present! Thanks for sharing!